Easy Black Beans & Rice Burritos | Yummytums! Posted at 12:55 pm by Yummytums! I take my lunch to work almost every day, mostly because I’m picky about my food and I like to know what’s in it. But it can be chore to prepare your lunch every day. This recipe is one of my standbys. 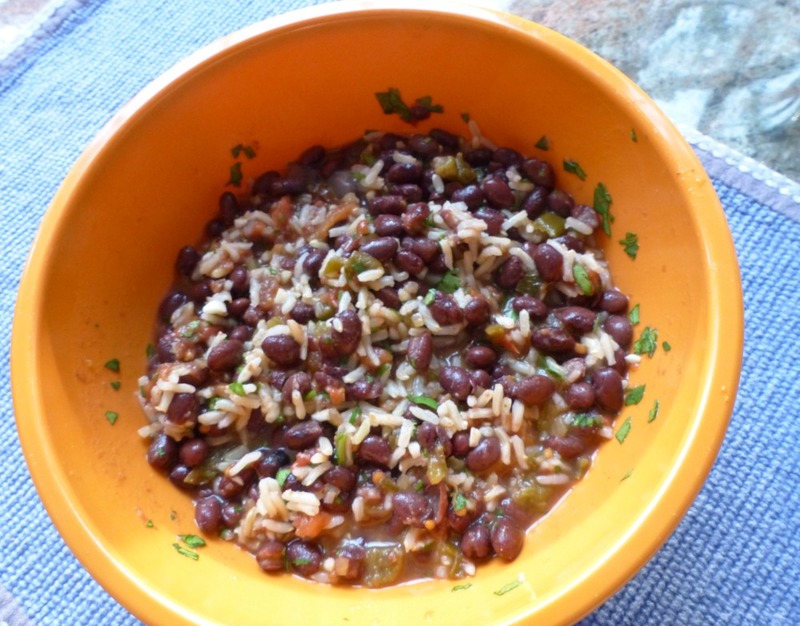 If you like black beans and rice, this is a great quick and easy recipe; it’ll make enough for three or four burritos and will keep in the fridge for several days. I buy organic black beans in a can and I use salsa that I canned from my garden last summer. But you could easily substitute store-bought salsa, just choose whatever kind you like. You’ll also need fresh cilantro, 1-2 cloves of garlic, rice and a lime. In a pinch, you can use packaged lime juice, but one or two fresh limes should do the trick. You’ll also need tortilla wraps. My favorite brand is Ole’ Xtreme Wellness flour wraps. I’ve never tried this recipe with corn tortillas, but I’m sure it would work; just choose whichever type you prefer. I usually prepare this recipe* on a Sunday because it takes some time to cook the rice. That’s really the only part where a stove or microwave is required. First, prepare the rice according to the package directions. Meanwhile, pour one can of black beans into a colander over your sink and rinse thoroughly. Allow them to drain. Chop the fresh cilantro and place it in a bowl. Juice the lime(s); you’ll want approximately two tablespoons of juice. Mince the garlic cloves and add those, along with the lime juice and drained beans to the bowl and stir lightly. Once the rice is done, add 1/2 cup to the bean mixture, then add the 1/2 cup of prepared salsa and stir. I usually drain the salsa a little bit. You want the mixture to be moist, but not too wet. Add salt to taste. That’s it! Lunch couldn’t be much easier. Just pack the rice and bean mixture and the tortillas separately and wrap them when you’re ready to eat. You could also add shredded cheese and microwave the wraps if you prefer to eat them hot. This recipe makes enough for two to three lunches.